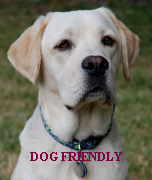 If you're looking for dog friendly holiday accommodation ...... you've come to the right place! A directory of pet friendly accommodation and dog friendly hotels, self catering, cottages, b&b, pubs, places to eat, attractions and holiday parks in the Brecon Beacons region of the UK. A One Stop Shop to help you gather information for successful holidays and days out with your canine best friend. Baskerville Arms Hotel Hay-on-Wye Herefordshire £62.50 Dogs can sleep in bedrooms. have access to all public areas except restaurant. pet food available. Blean-nant-y-groes B&B Aberdare £60.00 Dogs are welcome in cottages and studios. Access to a large area open countryside with footpaths, bridleways & mountain bike trails. Carlton Riverside Llandovery £60.00 Dogs can be left in bedrooms unattended. exercise area 100mtrs. Clyro Hill Holiday Cottages Hay on Wye Herefordshire from £480 Max. 2 dogs permitted, by prior arrangement. (see website for conditions). Craig-y-Nos Castle Pen-y-cae £62.50 Please bring you pet's sleeping box, bedding, and feeding bowls. Dogs are allowed in all public areas of the castle except restaurant and dining rooms. Kilverts Hotel Hay-on-Wye Herefordshire £80.00 Dogs can be left in bedrooms unattended. have access to all public areas except rear garden, restaurant and bar. exercise area 400yds. pet food available. The Bear Hotel Crickhowell £80.00 Dogs can sleep in bedrooms. have access to all public areas except restaurant. exercise area 5min walk. pet food available. Resident pet cat. The Lake Country House Hotel & Spa Brecon £90.00 Dogs can sleep in bedrooms. exercise area on site. pet food available. 2 Resident pet Labradors.